Well, the Daze hasn’t started JUST yet. As the old song goes, “We’ve only just beguuuuun…” It’s parade time, y’all! I’ve been waiting for this since about a month after Mardi Gras last year, after I’d had some time to recoup. I love Carnival season. I love how, starting at Twelfth Night, it just starts to build and build, ramp up into all this crazy festivity. My anticipation for Mardi Gras season begins well before Christmas, at work. Starting around November, my boss, involved in Many a Thing, starts bringing all his parade and ball and event mailers in and I sit down and get it all sorted out. Who’s attending what; when are the costume fittings; what is being added to the Rex/Chaos/Proteus/etc. throw packages this year? It’s mayhem, but it’s exciting to get that peek “backstage,” so to speak. 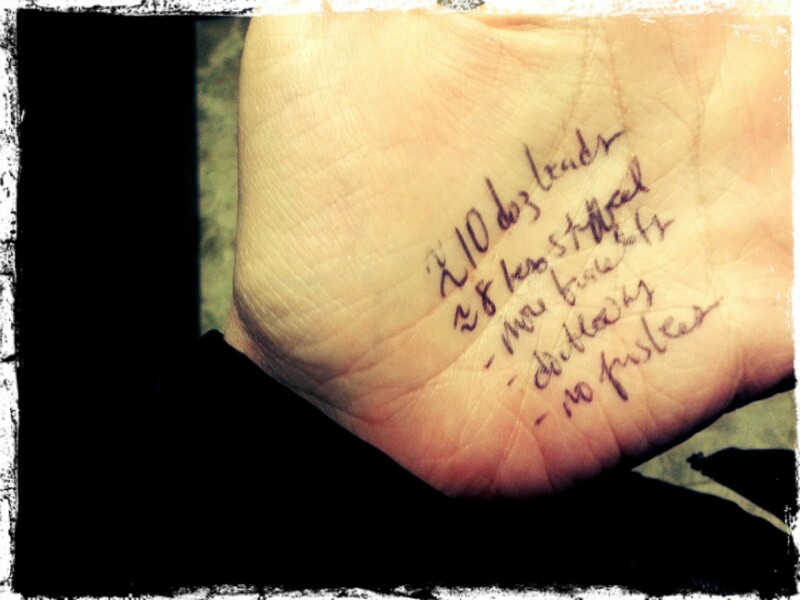 Getting ready for a conversation with the boss – I’d misplaced my notebook, ha! And then you roll through Thanksgiving and Christmas and New Years, and suddenly it’s Twelfth Night, and the changes start. Decorations start to go up on houses – I’ve noticed that different folks have their own individual tradition and timing for this. J and I got ours up the day before Twelfth Night so we could have them up as long as possible. Others do the same. Then there are folks who decorate just before the big run of parades. Just last Saturday, as I was lazing about storing up energy for Krewe du Vieux, I watched the inhabitants of the double shotgun across the street hang beads from their front porch railing. It was so cool to witness- there’s a family with kids on one side, an elderly gal on the other. They all shared, and decorated together. I love the respect for Tradition in this town. I love, too, this FEELING of everyone in the city being excited about the same thing at the same time. During that same timeframe, the King Cakes start rolling out. I’ve not consumed as much as I did last year, but I’ve had some good ones after that terrible start at Walmart. 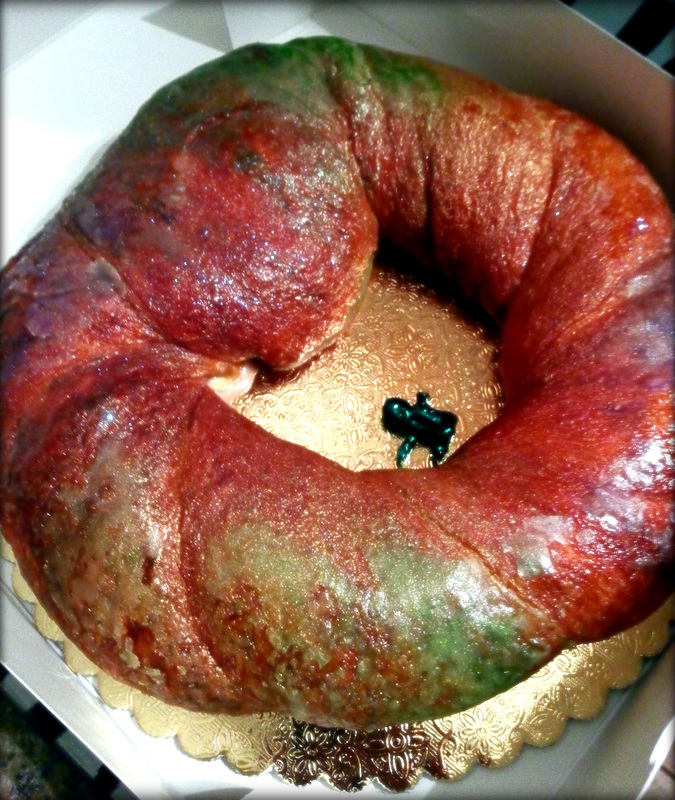 J and I discovered our Absolute Favorite this year: the King Cakes from Sucre. Oh lord, the King Cakes from Sucre. It’s more a traditional French style, light, flaky, melty and delectable. At $18 a cake, it’s not the sort you bring home every weekend, but it’s so worth it every once in a while. It’s not just the King Cakes that roll forth during this delightfully sinful time. OTHER King Cake and Mardi Gras themed goodies bust out. One simply must consume them ALL. It made procuring Superbowl munchies ridiculously fun this year. And now we’re in the thick of it, or about to be. Krewe du Vieux rolled last Saturday night and, starting tomorrow, it will be parades Friday through Sunday, with Monday and Tuesday to recover at work, haha, and then more parades next Wednesday all the way up through Mardi Gras day. Following what we’ve now set as a tradition, J and I caught Krewe du Vieux at the mouth of Pirates Alley on Royal St. I couldn’t believe it was our second one already, and that this is our second Mardi Gras here. Living on the Northshore last year, in retrospect, was a great way to get our feet wet. Having to make that drive, we had to pick and choose our battles, so to speak, so we got a good taste of a variety of parades (Muses, Bacchus, Rex and Zulu on the day itself, Krewe du Vieux and Chewbacchus) without completely burning ourselves out. Living here in the city now, right in the thick of it, is going to be a whole new experience! We live four blocks from St. Charles, and have a mission to See Everything. Wish us luck! I’m grateful that we got to see the Krewe of Eve roll in Mandeville last year. They were a lot of fun and I don’t know if we’ll ever see them roll again since it’s a Friday and an early drive across the Causeway. This year, I delightedly look forward to some other biggies that I did not get to see last year: NYX! Orpheus! Endymion! Living in the middle of it has been neat, so far, so I can’t wait to see what it’s like when things really start cooking. It was great, last Saturday, watching my neighbors come out of their house in wigs and tutus to head to KdV. It’s fun to listen to friends prepare for their rides. The whole vibe around here is all amped up. It’s not all without its logistical drawbacks, though, of course. On parade days, this week going forward through Mardi Gras, J is going to have a heck of a time getting home from work and finding a place to park near the house. Meanwhile, the streetcars will have shut down by the time I get off from work (despite our early closing time on those days), so I, along with the rest of my streetcar horde and some coworkers who live nearby and smartly do not move their car, will be walking home from the CBD to the Lower Garden District. I’m actually looking forward to that, plowing through crowds finding their spots on the route, taking some cool street photos, mayhap swinging past the Blind Pelican for some daiquiris to bring home, and getting some exercise to boot, to burn off that daiquiri. Even though it has not been a parade day yet, just commuting to and from work on the streetcar has been bedlam this week. I reached my car stop on Union St. Monday evening to discover that they had put up a parade stand there at some point during the course of the day. It reaches out into the street and covers the corner. Cars aren’t stopping there because there’s nowhere to stand to catch one! So, now, I’m ambling up a couple blocks to Common to snag a ride home. Life gets more interesting, the closer to Canal St. one gets. The other night, three streetcars breezed by us in a row, not stopping because they were too close together. When the fourth one came, one impatient and slightly inebriated individual stood out in the street, on the tracks, to ensure that the thing would stop. And that is how I learned just how to piss off a streetcar driver, and lose a ride home. He let the rest of us on, but kept the impatient drunk guy off, which was a good thing. Hoowee, nothing like ending a workday with a bit of drama! It was interesting to watch. Since then, this week, I’ve noticed this trend of…offness…with the streetcars. Every night this week, it’s been the same – all close together, all stuck in traffic because the vehicles on St. Charles can’t get anywhere fast either because all the parade stands are sticking out in da street. Mornings are no better – I got to my stop at my usual time, where I normally get a ride about 10 minutes later, and it took 30 minutes for one to show up. But there went three in a row, careening Uptown. Today, after work, I got on pretty quickly, and then it took 40 minutes to get from Common St. to the overpass after Lee Circle. Crazy. I’m actually looking forward to walking tomorrow and several days next week. I’ll likely get home faster! 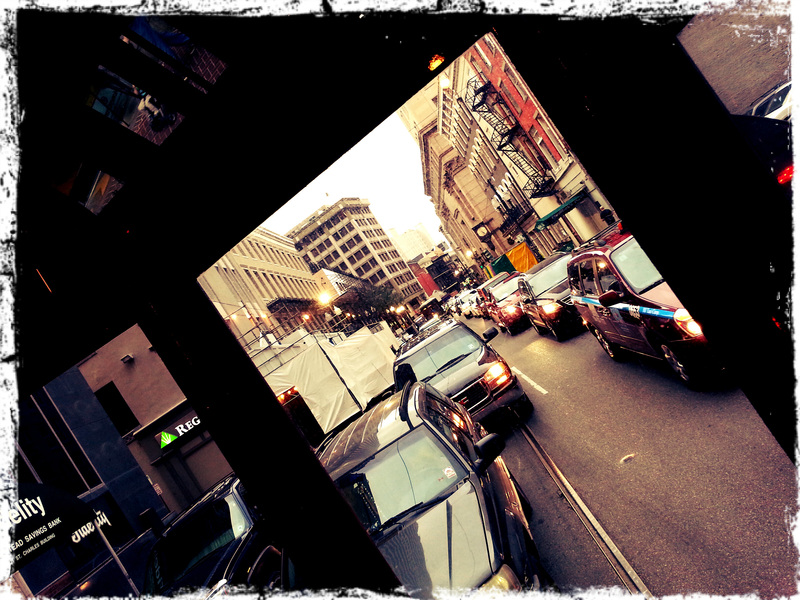 View of traffic from the back of the streetcar today. I’m not complaining overmuch, though. It’s just the way it is. I get frustrated with a handful of things around here, but daily living inconvenienced by Mardi Gras? Not a problem. You can’t be in a hurry in this city anyway. It all works out. So, that’s my ramble about the season for now. Tomorrow it’s parade time! And Saturday, and Sunday. I’ve decided not to shoot parades this year – I keep trying, but it’s always blurry and then I get hit in the head with a throw. 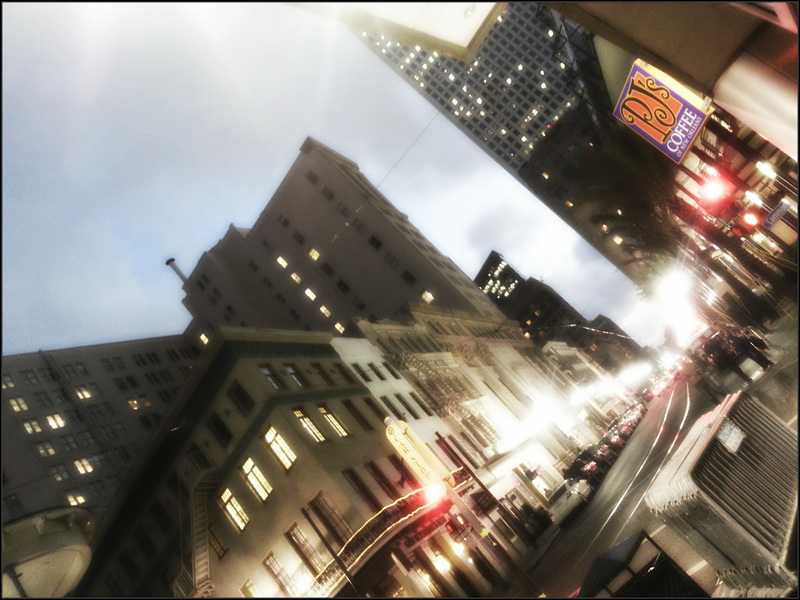 I want to capture street scenes instead. And then I want to enjoy this season as, finally, a part of a neighborhood, of a community here. Kick back and enjoy the moments. Because that’s really what it’s all about. 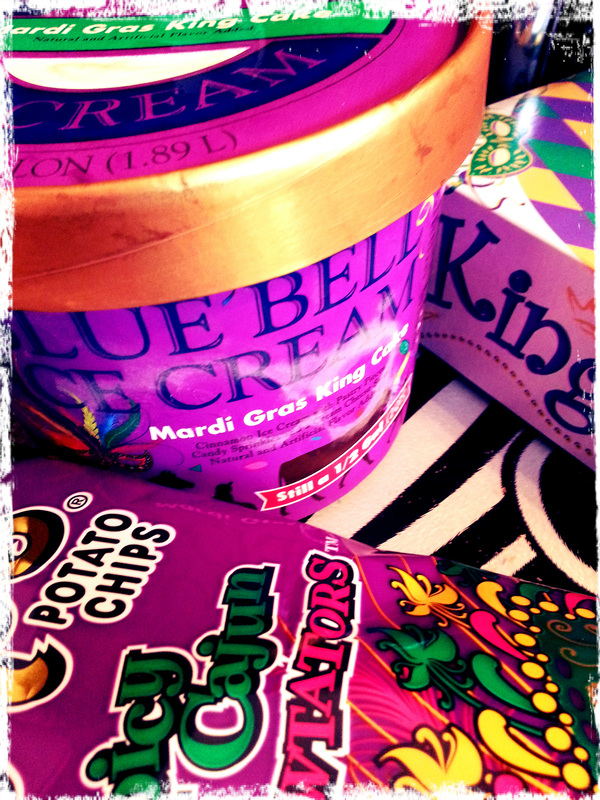 Next Post We Let Those Bon Temps Rouler! Sooz, go to http://www.kreweofnyx.org and go into the membership part! Sign up!!! Sounds like you are in the midst of chaos, crowds �and festivities. And that you love it, well, maybe some not so much. Like finding a parking spot and catching a streetcar. You have described it well enough in this blog so that I know this ole gal will stay close to home and wait to hear more about it from you.